Takahisa Koyama, of Spring8, for the development of “a novel hard X-ray nano interferometer combining an imaging microscope and a wave-division type interferometer ... (for) quantitative phase nano-imaging of weakly absorbing samples attaining 60nm resolution in 2D and 200nm resolution in 3D CT images.” At this conference Takahisa presented work on linear and circular Laue lenses. 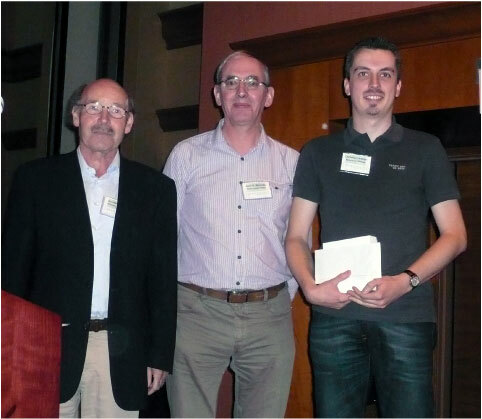 The Werner Meyer-Ilse Memorial Award is given to young scientists for exceptional contributions to the advancement of x-ray microscopy through either outstanding technical developments or applications, as evidenced by their presentations at the International Conference on X-ray Microscopy and supporting publications. Nominees are qualified if they have performed this work as part of a Ph.D. thesis during the three-year period prior to and including the conference (2008-2010), or are expected to receive their degree in the near future. The topics should be appropriate to the themes of the conference, and the work must be available to the award committee as conference papers, publications, or preprints at the time of nomination. Nominees must have submitted an abstract on their work to the conference. The award committee would appreciate receiving nominations by May 1, 2010 so that selected nominees can be invited to give oral presentations of their work during the normal conference program. Nominators should supply the nominee’s name, affiliation, and contact information, and provide a short (maximum length of one page) description of the work performed by the nominee and an explanation of the importance of the work. Please use the WMI award nomination form and include copies of relevant publications or preprints. For questions, please contact the award committee chairman, Alan Michette. Werner Meyer-Ilse was chair of the International Program Committee for XRM99 and leader of the x-ray microscopy program at Lawrence Berkeley National Laboratory. Werner died in a tragic automobile accident a few days before the 1999 conference. 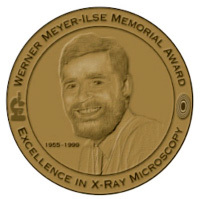 The Werner Meyer-Ilse award consists of a medallion and citation and is presented at each occasion of the International Conference on X-Ray Microscopy. It is awarded to a young scientist whose work over the preceding three years represents an outstanding contribution to this field. For the development of modified zone plates for phase contrast and high depth of focus applications. For the fabrication of Fresnel zone plates with 15nm finest zone width and for demonstrating their focusing properties. For his development of a segmented solid state detector and Fourier filter imaging for the scanning transmission x-ray microscope. For his contributions to the development of x-ray image formation based on the recording and reconstruction of the diffraction pattern from a non-crystalline object. For his contributions to the development of x-ray tomographic imaging of cryogenically prepared biological specimens.